Welcome to the CFUW Sudbury website! CFUW Sudbury is a vibrant, active group of women with a broad range of professional backgrounds, interests, ages and life experiences. Monthly General Meetings provide an opportunity to connect with other members, participate in Club business and enjoy various guest speakers. Click on the main headings, and subheadings, listed on the left for information or check out our Facebook site. Can't find what you're looking for? Check out the Site Map. Registration is open for the 2018-2019 year. Click here to fill out the online registration form and come join us. CFUW Sudbury offers something for all women - a chance to socialize, to develop personally, to contribute to the community and learn about advocacy and human rights. 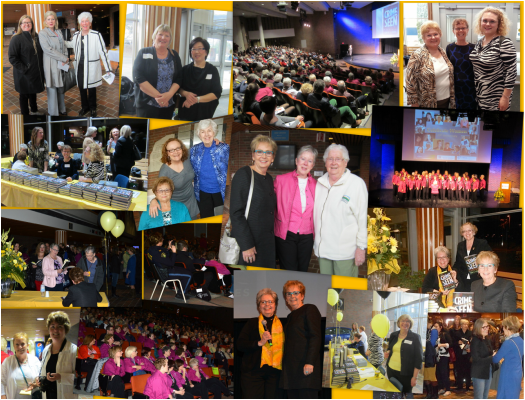 CFUW has played a critical role in women’s issues in Canada for over ninety years. CFUW welcomes all women and female students who support our mission and values. There are a wide variety of Interest Groups for members to join (book clubs, wine tasting, dining, pole walking, horticulture, film, et cetera). One of our major initiatives is the annual disbursement of awards in support of deserving women who are pursuing higher education in Sudbury. In 2019 CFUW will be celebrating its 100th Anniversary. In support of this occasion, CFUW Sudbury had chosen to make a donation to the Sudbury Youth Orchestra. We have been very fortunate that some Clubs, when they have had a change in circumstance, have made special arrangements with the CT. In March 2015, the Education Council-Wolfville transferred the proceeds of their education fund to the CFUW Charitable Trust to establish a new award, the CFUW Aboriginal Women's Award (AWA). In reviewing our Charter (which we are recreating as Articles and Bylaws), we became very aware that it is important for us, and all Clubs, to determine the allocation of their assets upon dissolution. We all sincerely hope that there are no occasions where this clause is necessary, however, we would respectfully request that Clubs consider including the Charitable Trust in such arrangements. Thank you for all your support in the past. Please be assured that the trustees are aware of the importance of the CFUWCT and of making careful and well informed decisions as we continue to raise money and administer funds to support the Fellowships and Awards Program of the Canadian Federation of University Women (CFUW). Dr. Danielle Martin has a message about health care: we need to make some changes. Martin - an author, family physician and VP at Women's College Hospital in Toronto - was in Sudbury Wednesday to talk about her book, Better Now, and the ways in which health care in Canada can be reimagined. Read the full Sudbury Star article here. June 14, 2018.